Hi everyone. 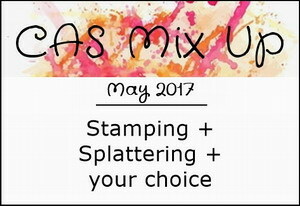 I'm hosting the CAS Mix Up May Challenge - Splattering. My CAS Mix Up card has stamping, splattering, watercolouring, heat embossing, and die-cutting. I created a video on the different ways that I splatter. I hope you'll take a few minutes to check it out. If you find it helpful, please give me a thumbs up on YouTube! Thank you!! We are happy to have Elaine (Craft-E-Place) as our Guest Designer this month. Welcome Elaine! Click HERE to see Elaine's and the Design Team's Splattered cards. Then come join us! The flowers, leaves, sentiment strip, and ribbon are all made from Snippets so I'm heading over to the Playground for a visit. I LOVE your Sweet splattered tag, Loll. The perfect background for your pretty spray of flowers. Wonderful CAS design too. TFS my friend. Hugs..
"Sweet" is the perfect sentiment as it fits your beautiful little tag perfectly! Love the splatters reflecting all the colours you used, and love the white stamped sentiment on the green. Your little tag with splatters is just perfect Loll for the lovely flowers. Love your videos short, sweet and to the point. Perfect. Another fantastic video, my friend! And a beautiful, splattered card to go with it! I love the abundant splatters and how you've put them on the tag to keep your card perfectly CAS! Pretty flowers too! Lovely, colorful tag with a sweet flower. Thanks for all the tips in the splatter video and those cards are great too. Containing the spatters to the tag was a great way to keep the card CAS, Loll, and those flowers are so sweet and colorful. The video was great and I think I need to load up my brush more when I spatter that way. Splatalicious Loll, love the tag! I really adore the splattered background you created for these pretty flowers! The colors are so cheerful! Your video was fun, I loved the effect with the distress stains and paints! Have to try this! love the colours for the splatters for the background and the pretty flower. This is so cheerful, Loll in your choice of colors! Love the embossed image! Thanks too for the wonderful tutorial. Many of us struggle with splatter and these are terrific ideas using products we have on hand! You have a knack for splatters! Thanks for the great video tutorial...and your card is gorgeous!